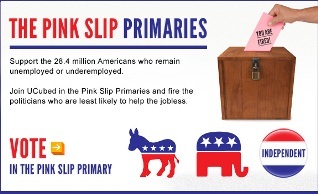 Starting on August 1, at 7:00 a.m., the jobless of all political persuasions will be able to see what candidates running for president have said about jobs, what their campaign appeals are, and what they’ve done to put Americans back to work. Voters will then be able to vote for the candidate of their choice in the party of their choosing. UCubed will announce the monthly and cumulative totals for the “Pink Slip Primary” on the last day of each month.